Queensland artists Ashby and Shaw will present an exhibition comprised of paintings and objects united by their diminutive size to examine how presentation and exhibition design can influence the understanding of a piece of art. John Mack states in The Art of Small Things (2007) that the museum is engaged in the ‘activity of creating intelligible, microscopic worlds from the universe they seek to condense’. (1) Nick Ashby and Elizabeth Shaw have condensed their universe into a ‘Miniature Museum’ that is its own intelligible microscopic world. Their museum moves us out of the present to an interior space that finds its inspiration in personal and collective history and the subconscious workings of memory. Their exhibition consists of paintings and sculptural objects set within the traditional European context of the ‘cabinet of curiosities’ or ‘wunderkammer’ with the disparate objects of this museum united by their diminutive size. Ashby’s paintings comprise multiple self-portraits, with individual and group figures, painted on diverse surfaces, small canvases, wood block cut-offs and product packaging. Shaw, a silversmith and jeweller, has made small sculptures based on the human figure, or parts of the body, by using lost wax casting and found objects both natural and made. In the case of Ashby’s multiple self-portraits their number and small size seem to concentrate their psychological power. In particular a series of locket-like pencil sketch portraits which are matched with pocket-watch glass faces recall the long history of miniature portraits in both high art and as popular personal keep-sakes, momentos or objects of remembrance and memorial. The impression of the ‘momento mori’ is further enhanced by distinctly sombre ebonised coloured frames, made by Ashby, which give each likeness an individuality and solid presence that suggest age and history. The spectre-like pallid faces that materialise from these frames emerge as if from Ashby’s subconscious. As facets of personality they fracture and reflect in multiples at the same time as suggesting that they might come together to create an extraordinarily revealing composite self-portrait. 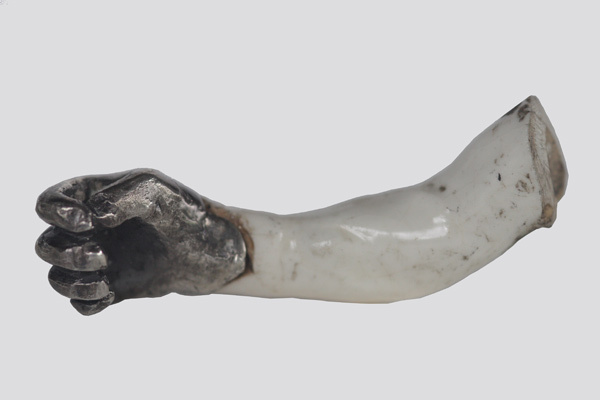 This fracturing or breaking-up is replicated in Shaw’s sculptures of Lilliputian body parts which combine found objects, such as the broken arm of a figurine found in the garden with a new cast silver prosthetic hand. Similarly, a leg-like remnant of a branch from the same garden is encased or framed with silver bands and brace-like callipers and fitted with a cast foot. Here memory and family history are tugged from Shaw’s subconscious. Explaining this similarity to leg braces Shaw relates the story of a great-great-aunt working with young polio victims. The body parts also remind us of Christian saints and reliquaries, body fragments venerated and housed in elaborate and beautiful frames and caskets, objects of coveted devotion, not unlike an individual’s own special and carefully preserved memories. Playing with and reinterpreting the concept of the museum as a repository of the valuable and the enduring, Ashby includes a number of paintings on discarded cardboard packaging (Barocca tablets, toothpaste packaging, and matchboxes). The loose style of these paintings is interestingly at odds with the traditional practice of minature painting. Figures and self-portraits with titles like ‘Fireman’s lift’ are allusive in their meaning but in using such ephemeral media with the truncated narrative scenes Ashby implies the transience and fragility of memory, which can break down, change and reconstitute over time, to create different narratives. The everydayness of these supports also parallels the way that memory returns unbidden and out of context amidst incongruous daily routines. A more unsettling and disturbing group of paintings shows images of Ashby–like clones in tightly packed groups that gather before a prone or prostrated naked figure on the ground. Corpse-like the prone body is reduced to the elemental, reminding us of the toppled shell of a fallen tree trunk. Such images again draw us toward the subconscious and it is easy to connect Ashby’s engagement with the darker side of the psyche with Freud’s concept of the ‘uncanny’ the word he coined to describe distinctive aesthetic experiences associated with certain feelings of mild distress, anxiety or disquiet. This is very much the effect produced by viewing these particular works. Many of the central themes of this exhibition are encapsulated in the installation which combines Ashby’s and Shaw’s work, it is in many ways a model for the overall exhibition and the key to the Miniature Museum’s purpose. Here a small sitting figure (arms clasped around its knees) sits on a wooden plinth that is housed in a wood and glass cabinet modelled on the cabinet for an asseyist’s weighing-scales. This work is redolent with associations not just of traditional museum display cases but also of small figurative measuring weights used in many cultures to weigh valuable materials such as gold or opium. The work has religious connotations of weighing the human soul at judgement and also underlines our own judgements, how we perceive and understand ourselves and how this Miniature Museum reminds us of the complex networks of past and present that make us human. The small figure within the larger space is isolated but the space enclosed is the minature museum of the introspective mind’s-eye. John Mack tells us that ‘The idea of the museum as it developed in Europe carried with it this sense of a place where discoveries were to be made if only the scholar or the visitor could draw it out of the mysterious assemblages of God’s and man’s creation.’(3) The space that this tiny figure inhabits is this space of potential discoveries, discoveries gleaned from the mysterious assemblages of Shaw’s and Ashby’s world.